April showers bring My flowers. So they say. However, here it is May and there are flowers but it’s still raining in San Antonio. San Antonio received almost 7.5 inches of rain in April, making it the seventh-wettest April since 1886, the first year that precipitation levels were recorded for the area. All this rain has made my flowers grow. Here’s a photo of the flowers in my garden which provided my inspiration for my card. I used the Flower Patch Polymer Bundle to create the flowers and leaves. For the sentiment I stamped the sentiment with Versamark then embossed it with gold embossing powder. The cloud shape is from the Word Bubbles Framelits set. 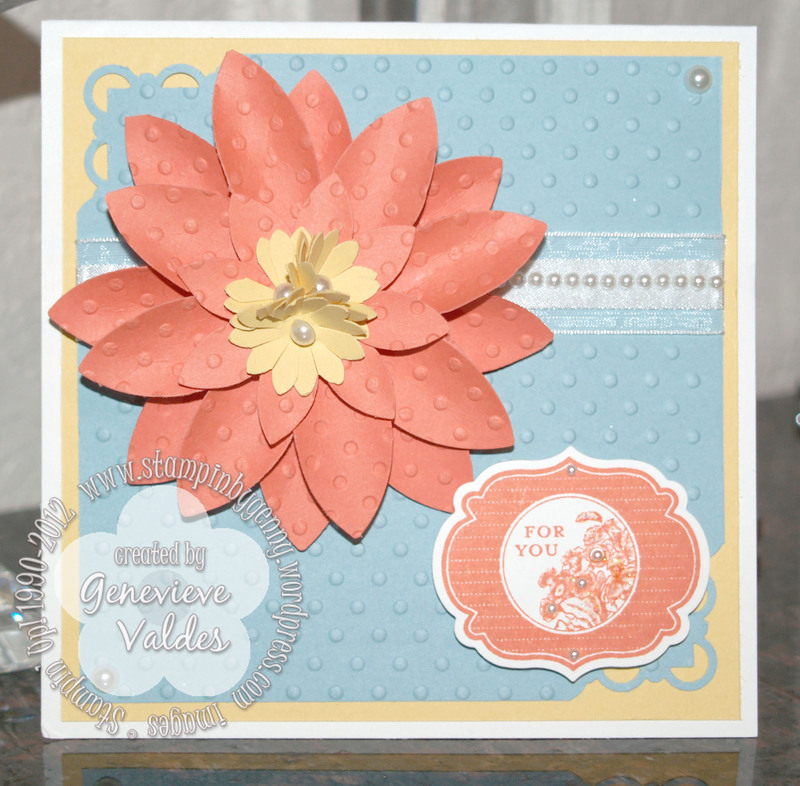 For additional texture the second layer is embossed with the Chevron embossing folder. Since mother’s day is tomorrow, I wanted to post the mother’s day card I made for my aunt who is like my mother. She has loved and cared for me and my siblings since our mother passed away when we were very young. She’s always been there for us and are truly blessed to have such a wonderful person in my life. I created the flowers with the Bouquet Bigz L Die. I followed this video to make these flowers. 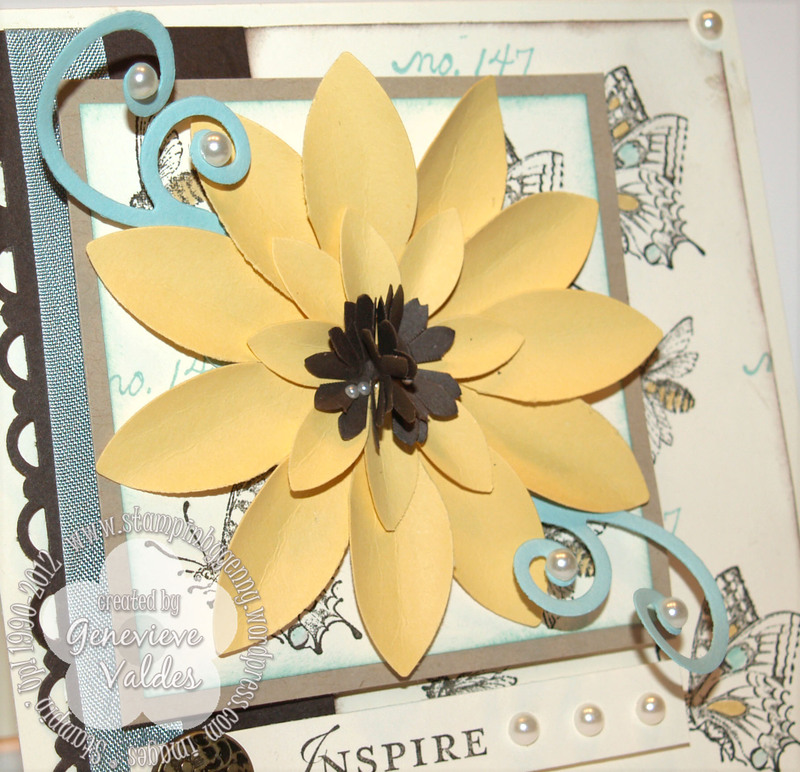 I didn’t use the stems part of the video since I adhered the flowers to the card front with a glue gun. For sparkle, I added Dazzling Details to all the flowers. To add a touch of vintage I used Typeset DSP paper. The pretty lace ribbon, Sahara Sand Lace trim is from the Occasions catalog. So pretty! The sentiment is from the retired stamp set Delightful Dozen, but you can use any sentiment. This card would also be a great for birthdays or thinking of you. I love that the Blossom Petal Builder card makes so many types of flower. Lately I’ve been stuck on making flowers with the larger and smaller petals. I punched 16 of the larger petals and 8 of the smaller ones. I then punched a 1-3/8″ circle and 1-1/4″ circle from an adhesive sheet to make two stickers. Punch another 1″ circle from the adhesive sheet. Use 8 of the larger on the 1-3/8″ circle, space them evenly. Adhere the other large 8 petals on the 1-1/4″ circle, space them evenly. Adhere the smaller 8 petals on the 1″ circle. Use dimensionals to adhere the petal layers. The larger petal circle is the base, then the 1-1/4″ petal circle followed by the 1″ small petal circle for the center. I then punched 3 of the larger flowers from the Boho Punch and adhered the 3 flowers with mini glue dots then embellished with pearls. 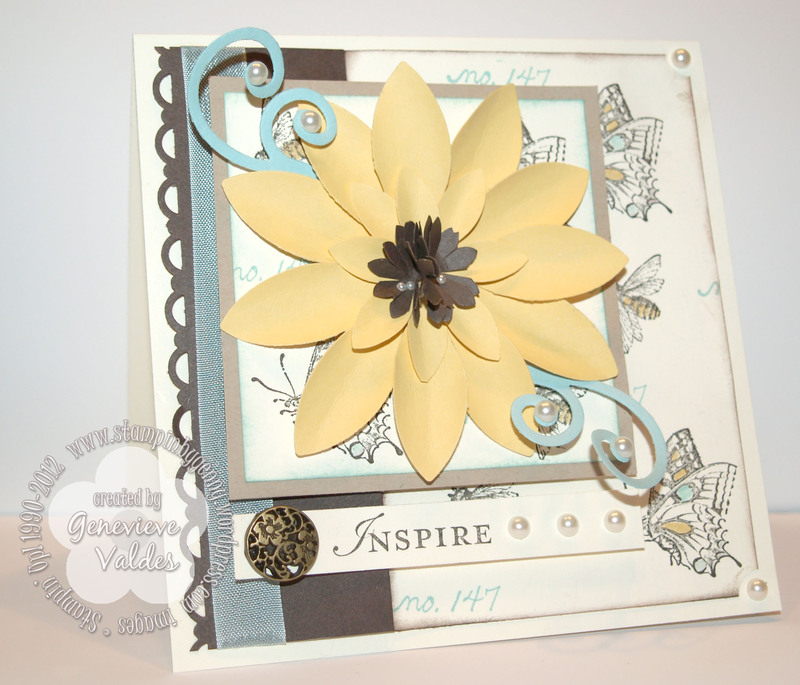 The sentiment is cut using the Framelit dies and coordinating stamp set, Apothecary Art. 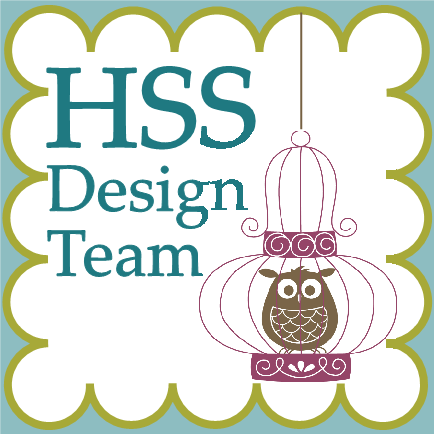 My color inspiration comes from Pals Paper Arts color challenge of – Calypso Coral, Baja Breeze and So Saffron.